For days 1 and 2, look here. 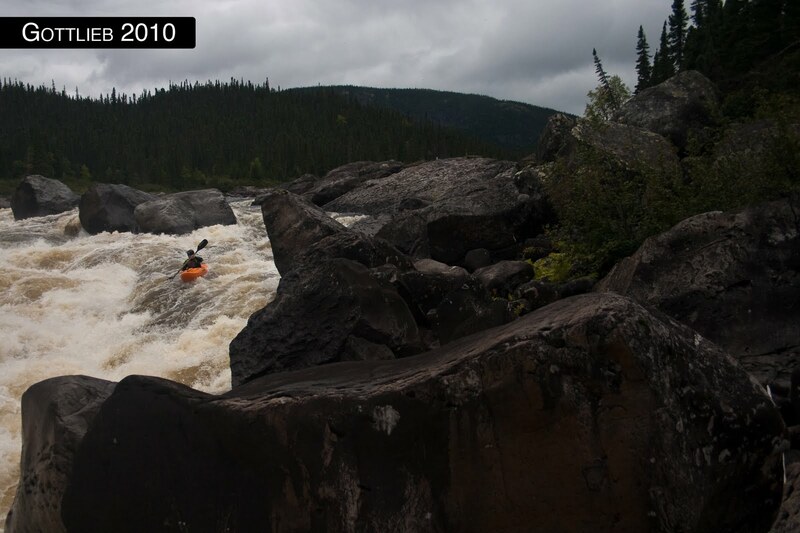 Isaac ran the huge boulder garden in the river right channel, boofing into the runout. 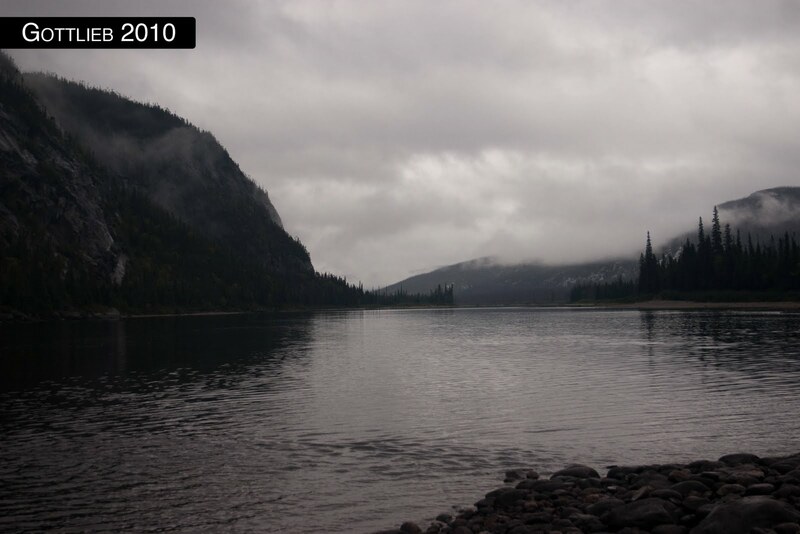 I ran a channel out of sight coming in on the right side of the photo. A few miles later was Rhino, one of the only rapids without side channels. Just a big, bouncy rapid scattered with holes and rocks. We ran a left to right line down the rapid trying to avoid the big hole at the bottom left. Jonathan ran a slightly different line, wanting to count the fishes on the river left side, but it all worked out. Reminded me a lot of Hance on the Grand Canyon, but roughly 8 times bigger. Me getting right of the big hole. Photo Levinson. Some more flat led to what looked like a boogie rapid — a small ledge that we could see from an eddy right at the lip. Boyce and Greg called it the “big breaking wave” rapid. Well, from the eddy I saw five people paddle into it, two flush through upside down, two bust through it no problem, and one get surfed briefly before escaping on river left. So, I paddled into the rapid, hit a curler that was much bigger than expected and literally folded me over backwards, rolled up and hit the “breaking wave.” Then I had the worst trashing I’ve had in years. Even when I was in a controlled sidesurf the thing was breaking over my head so I was pretty much underwater. I probably hit twenty ends before it tore my helmet off, and then finally managed to surf out ten or fifteen seconds later, but by then it was too late. My helmet had run the next little ledge and was floating downstream to the next huge horizon line. I eddied out with Greg and Jonathan who then cruised downstream and I watched as everyone in the group disappeared over the misting horizon, leaving me to portage a side creek with no helmet in order to make downstream progress. About a quarter of the way across I dropped my paddle, which then proceeded to route the next drop in the same fashion as my helmet. So there I am helmetless, paddleless, about to get cliffed out on river left, with no friends in site, many, many miles from civilization. I handpaddled across the rest of the creek and clambered up the left shore to see if I could see anything. Isaac eventually comes up the river right shore — a long way away — holding my helmet and my paddle. Good news, but how was I going to get to him? Well, it was the scariest handpaddling I’ve ever done, I’ll tell you that. Ferrying across a boily current above an unknown misting horizon line with no paddle and no helmet is not something I’d like to repeat…but it worked out ok, and I was reunited happily with my paddle and helmet, none the worse for wear. This misting horizonline was called Adder by Greg and Boyce, with a big S-turny drop on river left and a nice slide to boof in the middle that I ran. 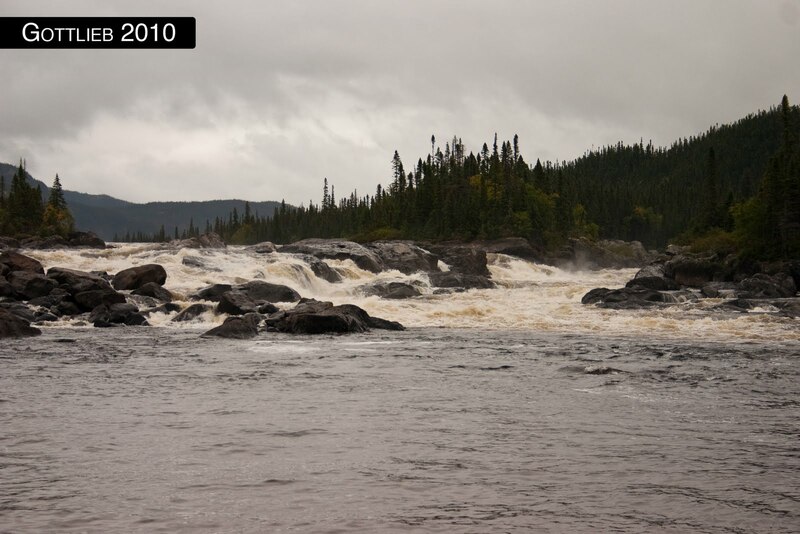 On Fred Coriell’s blog, it’s the first drop of “Double Mister.” The next one downstream split around an island with river left being a huge, scary unrun rapid and river right being a huge, scary, but incredibly easy rapid called Horseshoe Hole. Apparently somebody lost a boat in here last year and had to ride the rest of the river down to Hydro-Quebec’s construction site on the sterns of his partners’ boats. If he really did go into this hole he’s lucky that’s all he lost. Jonathan cruising around Horseshoe Hole, that massive looking thing above his head. Photo Levinson. The day wrapped up with some more flatwater above an (as far as we know) unrun drop called Le Maudite, where Boyce and Greg had camped previously. It’s a big, big rapid with a leadin with big curlers on both sides that funnels you right into one huge hole which is immediately backed up by another even worse hole. The line is to bust left or right of the holes at the bottom, and which one is better probably varies with water level. Isaac tried to bust left and ended up heading straight into the top hole, but after a brief working managed to surf his way out on river left in just about the only spot he could avoid the second hole. The rapid is now called Le MauJoo in his honor. Isaac looking small with about 1/5 of the rapid visible. We ended up going about six miles further in an effort to find a beach camp because it was going to rain, which was a good decision — it knocked a good chunk out of the next day, which was supposed to be 37 miles flat, and we found a great campsite across the river from half of a canoe that Boyce and Greg had seen the previous year further upstream. Check out days 4 and 5 here.